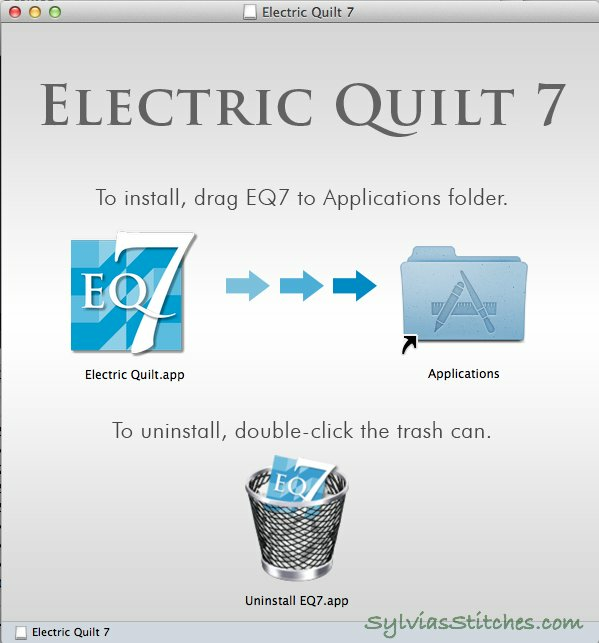 Electric Quilt EQ7 for Mac! I am soooo excited! I now have EQ7 running native on my Mac!! No more VMWare or Parallels to a run Windows emulator needed. Happy Day! The process to migrate my EQ7 (PC version) to my Mac went smoothly. 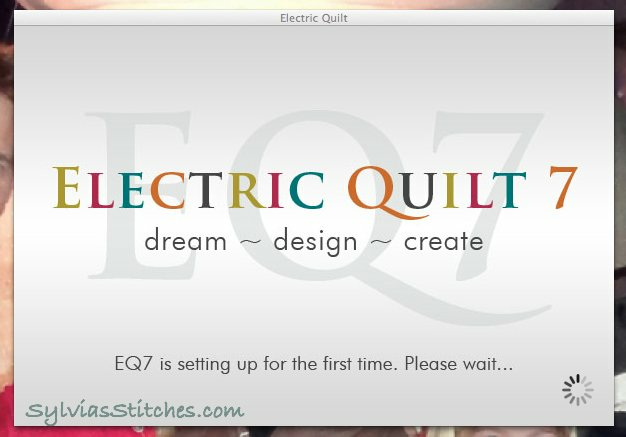 I own EQStitch as well, and Electric Quilt has worked out the licensing so that I am able to migrate my EQ7 to the Mac. 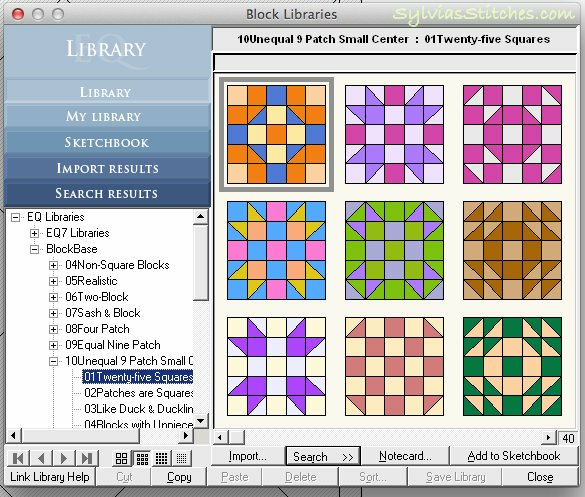 Electric Quilt still allows two active licenses at any time, so although EQStitch does not currently run on the Mac (maybe in the future?? ), I am still able to have both EQ7 for Mac and EQStitch on PC active at the same time. Purchase a EQ7 Migration Kit. This product will allow you to use your current EQ7 license on another platform. The first step will be to verify your EQ License. Make sure you have your EQ7 (not EQStitch) license ID and password. I was a little concerned at first when I couldn't find my EQ7 disc. I found it, along with the license ID and password, in the inside back cover of my EQ7 user manual. This is a software download over 700MB in size. It took me about 6 minutes to download with our Internet connection (we have FiOS). The cost for this product is $24.95, which I thought was very reasonable. Once downloaded, find the file in your Finder. My file was Electric_Quilt_7.dmg. (.dmg is a Disk Image File.) Double click on this file. Your system will mount this disk image file, and a window will pop up with instructions. Drag the EQ7 icon from this window onto your Applications folder, as instructed. The installation will then take place. It takes a few minutes to complete. Once it is done, you'll see your awesome Welcome screen open in Electric Quilt 7! 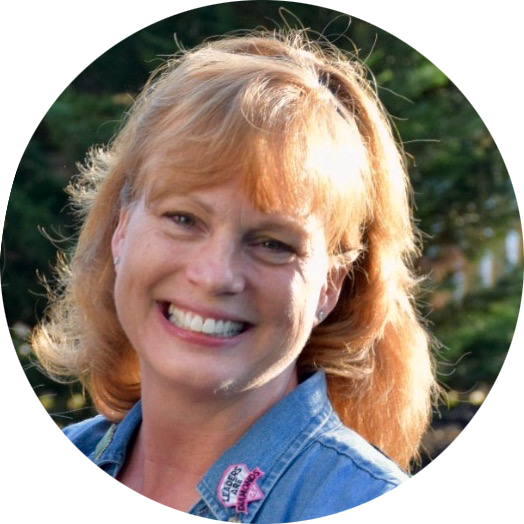 Be sure to click on the link in the Welcome screen for the Read Me First information. It does have useful information. The second part of getting EQ7 for Mac to run like my version on the PC is to link the separately purchased Add-On Libraries. The libraries files need to be copied from the PC side to the Mac. Instructions for using Add-on Libraries are on the Migration Kit page. I added my BlockBase block library files and EQ Stash Online fabric library files. BlockBase blocks show up without a problem. The Add-On Libraries show up under the EQ7 Libraries. One Note for EQStitch Users: Once EQStitch is installed, project files are saved at .PJE files (instead of .PJ7) even if they do not contain any stitching. 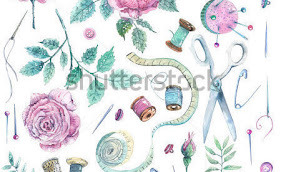 EQ7 cannot open EQStitch files. I had to explicitly save my project files as .PJ7 (without stitchings) so I could open it with EQ7 for Mac. I only have a few projects that contain stitchings at this point. I will just keep those projects with EQStitch, and not use them with EQ7 for Mac. So, how does EQ7 for Mac run? Quick is my first thought. My original PC version of EQ7 running under a Windows emulator does run slow at times, and is very frustrating. Now on the Mac, there is no more lag time. Hooray! 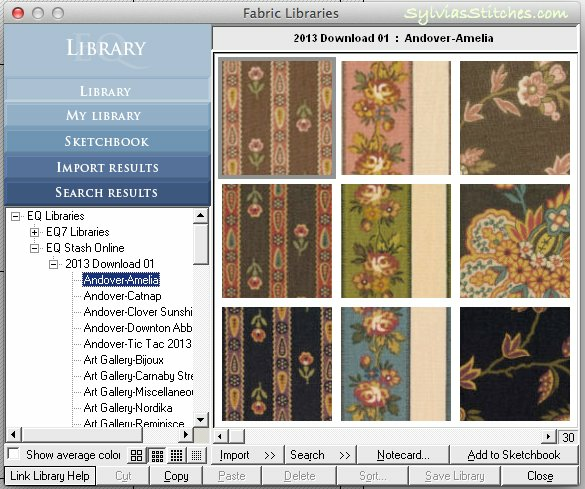 I brought up my Annie's Mystery Quilt project, and it looks same as it did on the PC. I even worked up the third block in the series (blog post coming next!) and EQ7 for Mac works just like it did on the PC. No problems. Wonderful so far! 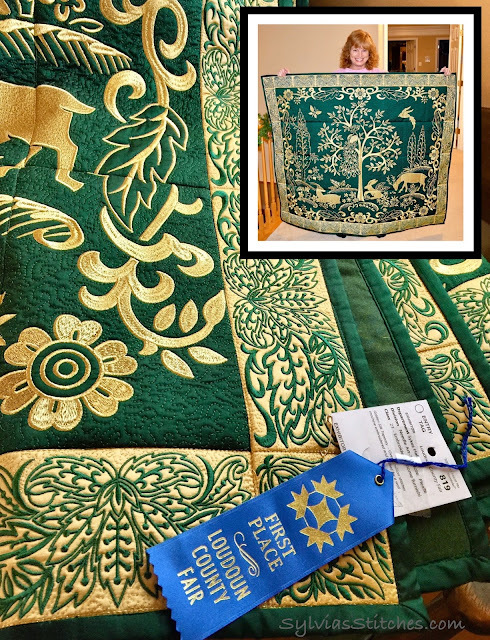 Thank you Electric Quilt for investing in a Mac platform for your flagship product. 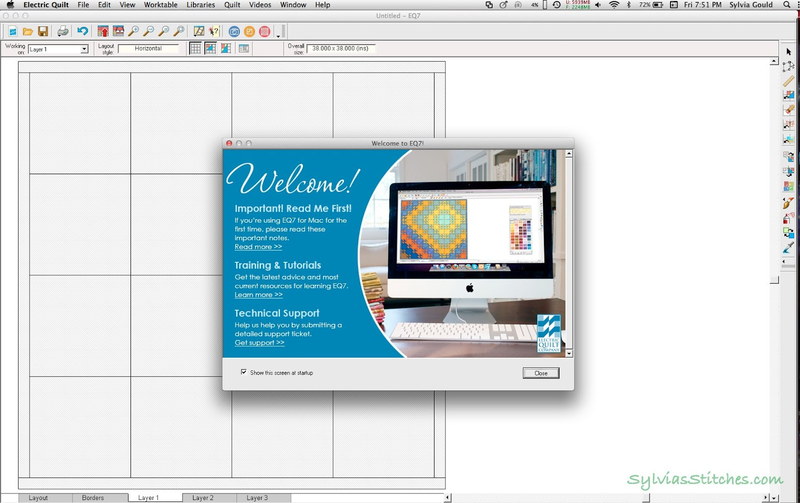 It will make many current customers happy, and attract many Mac users who have been waiting for a super quilt program! Next on the EQ Wish List is EQStitch for Mac, please! Yep, my migration went smoothly as well, couple of issues since, but I have been so excited I haven't noted them down to feedback to the developers. 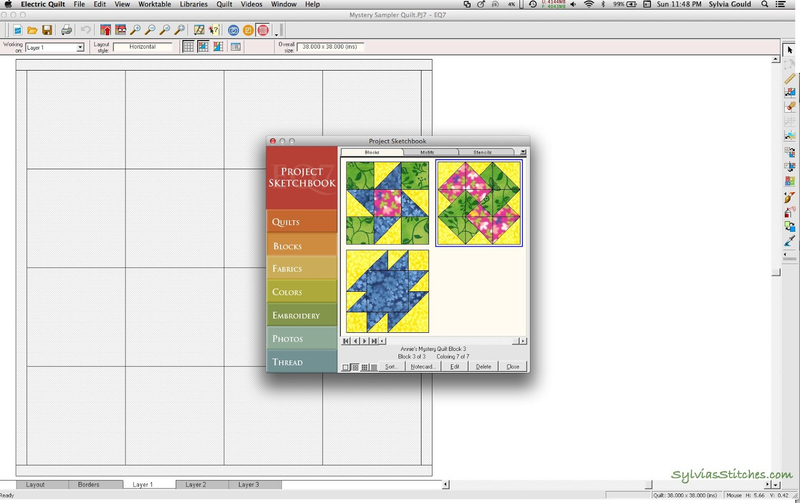 I've just got an Accuquilt Go, so have been putting loads of the basics blocks in a Go project file, fantastic! 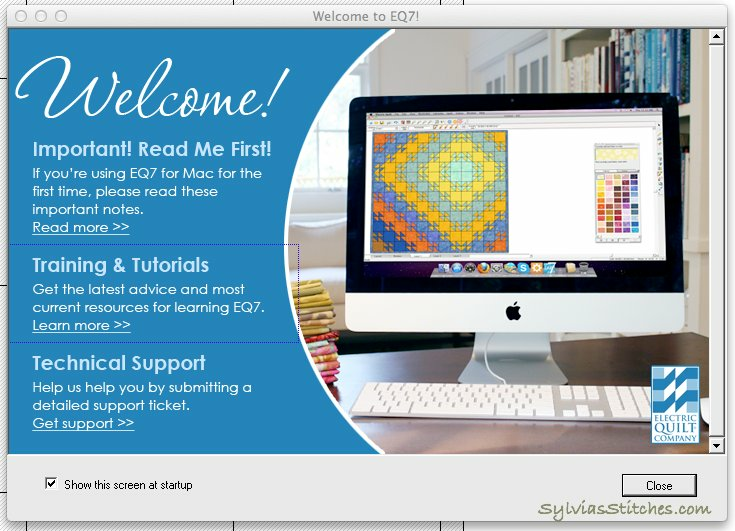 Thank you Sylvia for the information on EQ7 migration to the Mac. I have successfully installed it. I'm so happy not to have to use Parallels and run EQ7 in PC mode. This is encouraging. However, I am still not clear whether the Mac version of EQ7 will open files created with EQ7 on a PC? If it does, I may buy it so that the quilt designer can email her templates to me (instead of snail-mail for me to scan) for finishing. If not, I'll continue to use Adobe Illustrator!